Pestology is a family business, established by Simon Slater in 1997. We are based in the shadow of the Malvern Hills in Worcestershire but we cover a large area of the West Midlands and into the Cotswolds, Gloucestershire and Wales. 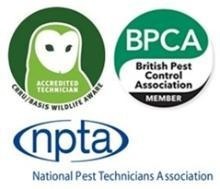 Pestology is a well known and very successful business, regularly achieving the best results for pest control situations. The 'Services' page has more details on what we can do. Safe, sensible, and effective pest control is always our priority.